I've definitely decided that Urban Garden One (where my front lawn once was) and Urban Garden Two (in the back of my house to the side of my driveway) are magical magnets for love and sharing. 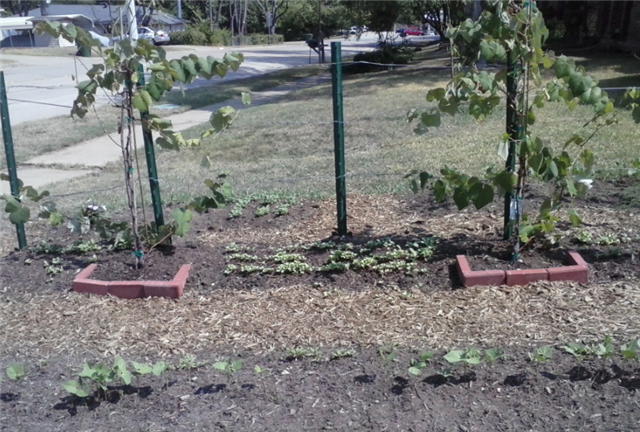 To date, I've met 54 people who have stopped by to chat and talk with me since I began these gardens on June 12, 2013. As I've mentioned, I've lived at this address for 8 years. Prior to the planting of my gardens, not a single person ever stopped by to chat with me--not once in 8 years. But then I wasn't out in my yard that often either prior to the gardens. Most of these people, all complete strangers, have shared personal stories about their lives with me. 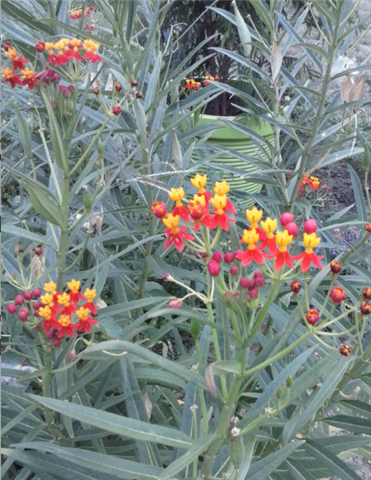 There must be something about a garden that exudes love and trust. Perhaps human beings just intuitively know that someone who grows food is a person to be trusted. Today I had yet another of these experiences. A couple from Pakistan (Daniel and Maq Sooda) stopped by. 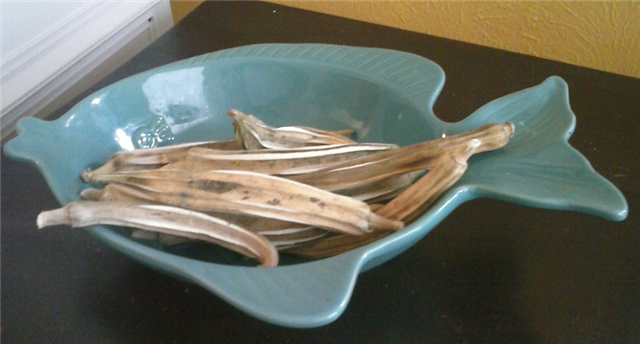 They asked if they could have the large pods of okra I had drying out on a small shelf on my front porch. I was drying them for the seeds, but believe me, I already have more okra seeds now than I'll have room to plant next year. I explained to them they could cut the more tender okra from the stalks in my garden if they wished but the pods were too hard to eat. They did want the tender pods, but also wanted the large pods as well. As most of the people who stop by, they educated me further in my knowledge of food and gardens. One can eat okra seeds. I did not know that. I never even considered it. I hope to learn more from Daniel's wife. She mentioned that she cooks very spicy food. Sunday they are celebrating their 32nd wedding anniversary and said they will bring by a dish for me--seems like I should be the one bringing food to them. 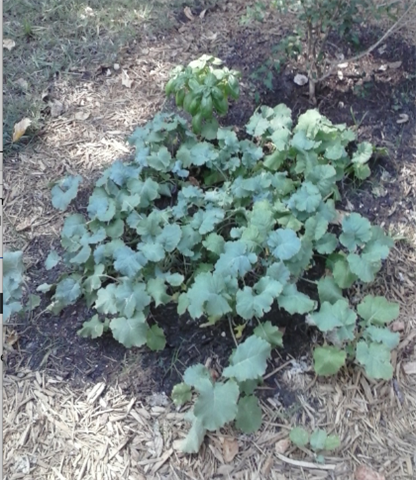 I also gave them Siberian kale, spinich, swiss chard and eggplant in addition to the okra. Daniel went to their car and gave me a large bag of cheese croissants and an entire carrot cake. I protested their generosity as I live alone but they insisted. As it turns out I was able to pass that food onto a couple I know who plan to go to a family gathering tomorrow. 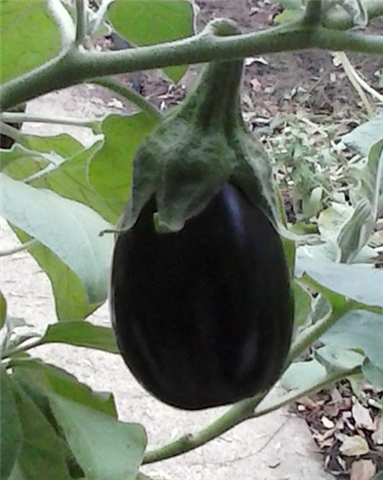 It seems my garden has many ways to produce food in addition to the seeds I plant in its soil. About two months ago my garden introduced me to a man who is now very special in my life, but that's a story for another time. But take it from me. If you are really ready to change your life, I recommend that you start digging up your front lawn and replacing it with edibles. Your life will never be the same. I promise. Very good in my salads! OKRA SEEDS in my kitchen. I just ate about 8 of them. They taste somewhat nutty like buckwheat. I wonder if I ground them in my coffee grinder if I could use them for flour? At any rate, it's nice to know that I can eat the seeds of those pods that I allow to get to large to eat. That's one less thing for me to feel guilty about. Thank you Maq Sooda! 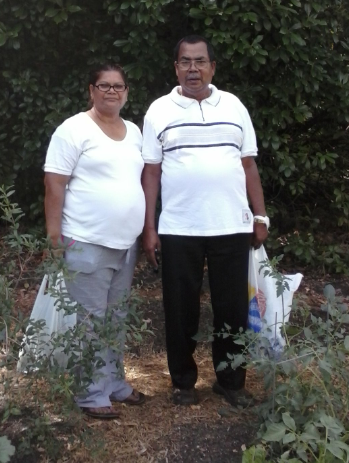 Maq Sooda and Daniel Shafi - Visitors to the Gardens of Love and Friendship. Friday September 27, 2013. Happy 32nd Anniversary on Sunday! These two brought love and caring to me and my gardens today simply by being the example of what it looks like. They referred to me as "sister"--so gentle and sweet. We exchanged phone numbers and hugged like old friends when we parted. As time marches on, my appreciation of my urban gardens deepen as well as my intent to eat local, eat organic, and eat vegetarian. Just tonight I read that the USDA has approved a process whereby chickens grown and slaughtered in the USA will then be shipped to China for processing. Absolutely unbelievable! In the past year China has been caught passing off rat meat as mutton, selling sausages filled with maggots, and having an outbreak of H7N9 bird flue in live poultry. Now they are going to be processing chicken for millions of Americans. Certainly this should be a wakeup call for eating locally grown produce. Labor Day weekend I decided to expand Urban Garden 1 which is located in my front yard. I dug up a 20 foot by 40 foot area. In it I've planted two grape vines, radishes (which are begging to be thinned) french beans, more swiss chard, spinach, carrots, and artichokes. All seeds have germinated. The twins are doing fine. 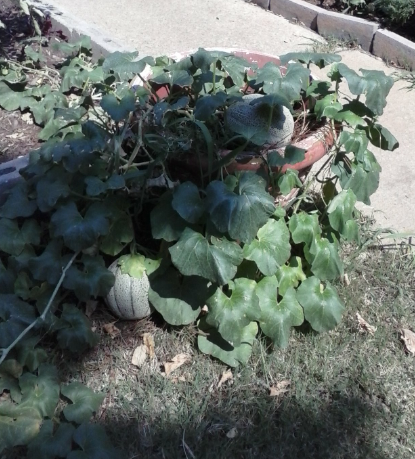 Thus far, this one pot has produced three cantaloupes. The previous one was delicious (and yes, I saved the seed). 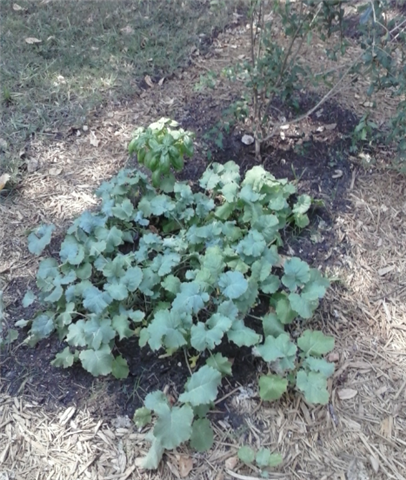 Also on Labor Day weekend I planted some Siberian Kale. Already I've had several salads using this delicious and nutritious green. Below the Kale is a photo of some of the Swiss Chard that is also growing in my front yard. Some of the leaves are now so large they will need to be cooked. 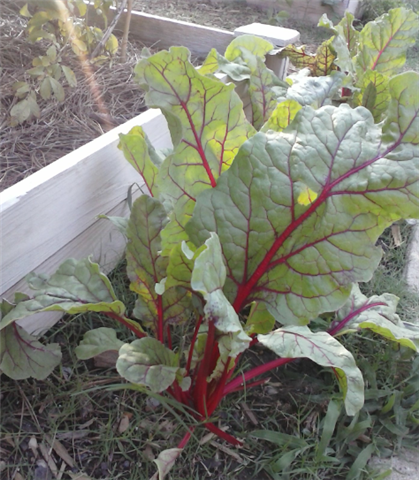 Chard leaves contain 13 different polyphenol antioxidants. One of the primary flavanoids found in Swiss Chard leaves is syringic acid which helps to regulate blood sugar and thus is a good source for blood sugar control.